EtBr has been the predominant dye used for nucleic acid staining for decades because of its low price and generally sufficient sensitivity. However, EtBr is a highly mutagenic material. The safety hazard and costs associated with decontamination and waste disposal can ultimately make the nucleic acid dye expensive to use. The dye experts at Biotium developed the extremely popular GelRed® and GelGreen® fluorescent agarose gel stains to not only be the most sensitive DNA gel stains on the market, but also the safest: they are the only DNA gel stains that have been tested and found to be safe and non-toxic by independent laboratories. To learn more, visit the GelRed® and GelGreen® technology page. Click here to download an App Note on using GelRed® and GelGreen® on the UVP GelDoc-It® imaging system. Click here to download an App Note on using GelGreen® on the UVP GelDoc-It® imaging system with the Visi-Blue™ Converter Plate. GelRed® and GelGreen® stains are also available pre-coated to ultra-pure LE agarose. Using GelRed® Agarose & GelGreen® Agarose is easy and convenient, and obviates the need to handle concentrated fluorescent dye. GelRed® & GelGreen® do not readily penetrate cells. HeLa cells were incubated for 30 minutes at 37°C with 1X SYBR® Safe, GelRed®, or GelGreen®. SYBR® Safe rapidly bound to DNA in live cells resulting in bright green nuclear staining. GelRed® and GelGreen® were unable to bind DNA in live cells, shown by the absence of fluorescence. 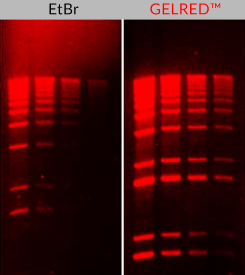 Comparison of ethidium bromide (EtBr) and GelRed® in precast gel staining using 1% agarose gel in TBE buffer. Two-fold serial dilutions of 1 kb Plus DNA Ladder (Invitrogen) were loaded in the amounts of 200 ng, 100 ng, 50 ng and 25 ng from left to right. Gels were imaged using 300 nm transilluminator and photographed with an EtBr filter. 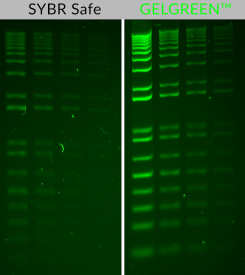 Comparison of GelGreen® and SYBR Safe in post-electrophoresis staining of 1% agarose/TBE gels. Two-fold serial dilutions (200 ng, 100 ng, 50 ng and 25 ng) of 1 kb Plus DNA Ladder (Invitrogen). Gels were imaged using 254-nm UV transilluminator and photographed with a SYBR filter. PAGE GelRed® is a version of our popular GelRed® dye that was specially formulated for staining DNA in polyacrylamide gels. Like the classic GelRed®, PAGE GelRed® has also been found to be safe by independent laboratories. Download the PAGE GelRed® Safety Report. As Biotium continues to innovate in gel staining, we now offer a truly unique visible DNA gel stain called DNAzure®. 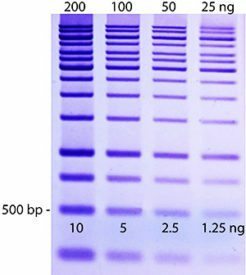 DNAzure® dye binds to DNA in an agarose gel, and after exposure to light develops visible blue bands. The blue staining is long-lasting and doesn’t require any further light source, making it ideal for cutting out bands (no worry about UV light damaging your DNA sample or your eyes). Even more amazing is that this visible stain is more sensitive than more fluorescent DNA gel stains. 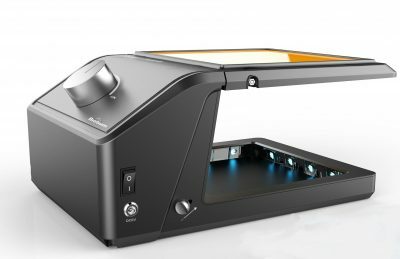 The Gel-Bright™ LED Gel Illuminator was developed by Biotium as a simple, effective device for the visualization of fluorescent green DNA gel stains such as GelGreen®. It is also able to photoactivate the visible blue DNA gel stain, DNAzure®. 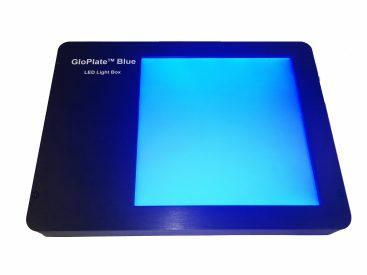 The Glo-Plate™ Blue LED Gel Illuminator is another blue LED device that is able to photoactivate the visible blue DNA gel stain, DNAzure®. It’s flat surface provides even illumination across the gel. The main difference between GelRed® and GelGreen® is their fluorescence excitation and emission wavelengths. GelRed® has red fluorescence, similar to ethidium bromide. GelGreen® has green fluorescence, similar to SYBR® Green or SYBR® Safe. Both dyes are compatible with standard UV transilluminators. GelGreen® is also compatible with blue light transilluminators, which allow users to avoid exposing themselves and their DNA samples to ultraviolet radiation. GelRed® and GelGreen® have higher sensitivity for double stranded nucleic acids compared to single stranded nucleic acids, but GelRed® is more sensitive for staining single stranded nucleic acids than GelGreen®. GelRed® is about twice as sensitive for double stranded nucleic acids compared to single-stranded nucleic acids, and about five times more sensitive than GelGreen® for staining single stranded nucleic acids. For more information about these products, please visit our DNA stains technology page. GelRed® is compatible with a standard UV transilluminator (302 or 312 nm). GelGreen® has sufficient absorption between 250-300 nm and a strong absorption peak at around 500 nm. GelGreen® is compatible with a 254 nm UV transilluminator or a gel reader with visible light excitation such as a Dark Reader or a 488 nm laser gel scanner.